Pilsner (also called Pilsener or simply Pils) is the world's first blonde lager, and is therefore arguably the most successful beer style in the world. Some statistics report that 90% of beers drunk in the world today are made according to the Pilsner style or a style directly derived from it. All styles of Pilsner are very light in colour, brilliantly clear, moderately effervescent, and are often strongly hopped with an assertive up-front bitterness bite. They all originate and are modeled largely after a beer style invented in 1842 in the Czech city of Pilsen (from where it took the name). That original style is now called Bohemian Pilsner. This recipe's for an offshoot called German Pilsner. It's similar, but still different enough to garner its own style name. The blonde lager of Pilsen that we today call Bohemian Pilsner was an instant success when it was first released, not only on its home turf but also in the most elegant cafes and bistros of Europe. Breweries across the border in Germany, began also to be interested in the Bohemian phenomenon ... they had to, because it started to eat into their own sales. This was the time in Europe when the emerging railway network made the transportation of beer possible to just about any major city. 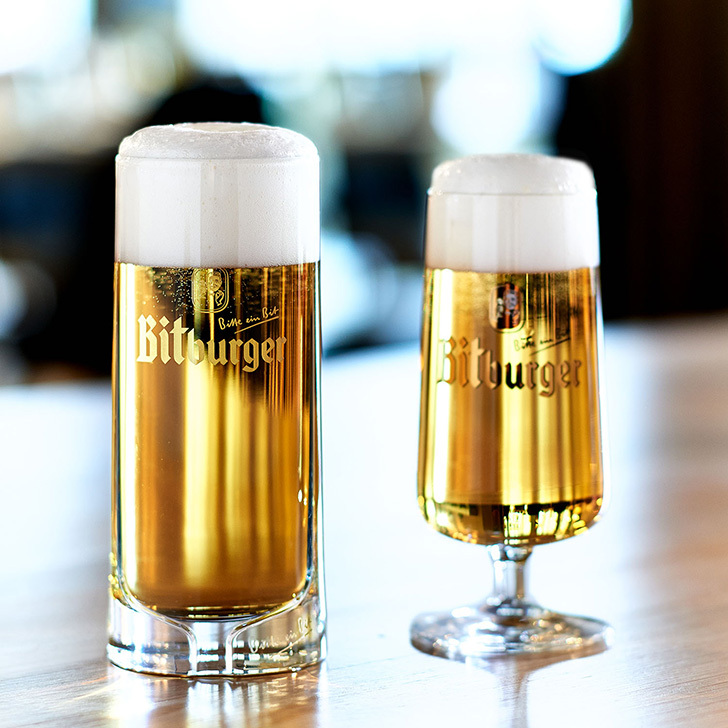 One of the first imitators was Germany's Bitburger brewery, founded in 1817 by Johann Wallenborn. Their flagship product became Bitburger Premium Pils, a bright, fresh golden colour German Pilsner style beer with a rich frothy head, and the unmistakable hop bitterness of gentle noble German hops. Today, Bitburger Pils has become one of the best-selling German brands, with exports to over 70 countries around the world. The largest volumes go to Italy, the United States and the Netherlands. 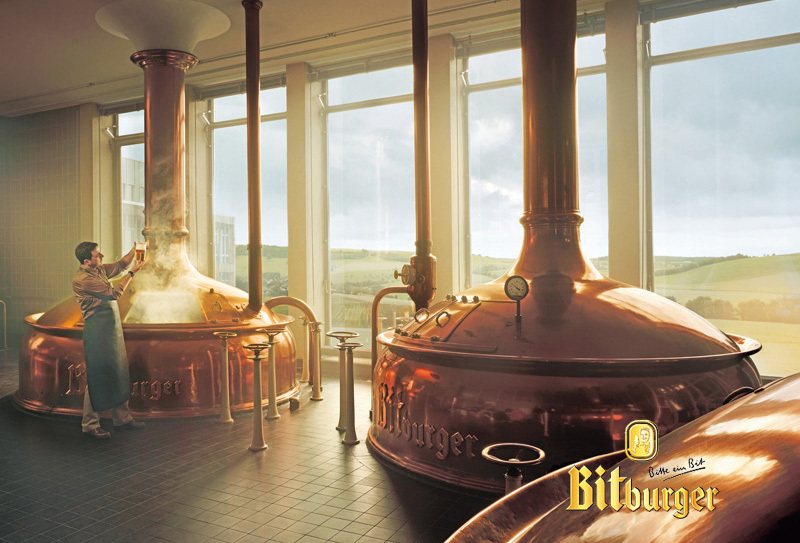 Bitburger also gets into the history books as the first brewery to create an exclusive glass for a beer brand. In 1964 they release a nicely-proportioned goblet on a hexagonal stem to emphasize the character and uniqueness of Bitburger Pils (shown on the right in the photo at the top of this page). It's interesting to note that 50 years later, the Spiegelau IPA Glass designed by Dogfish Head and Sierra Nevada picked up some of the traits which help boost hop aromas. 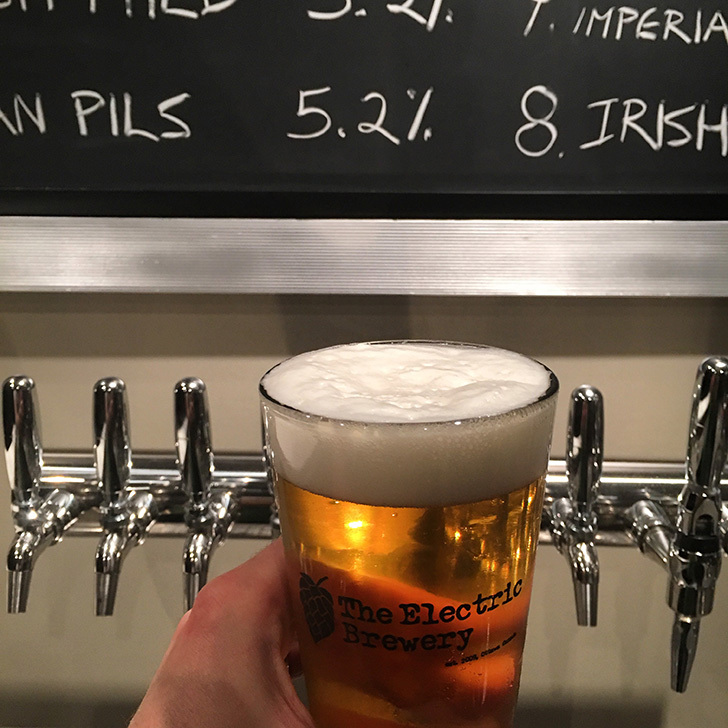 Compared to the original Bohemian Pilsner, a German Pilsner is much more attenuated resulting in a crisper, drier beer (for comparison sake our Bohemian Pilsner finishes at 1.014 while this German Pilsner finishes at 1.009). A German Pilsner is also less malty as it should never use specialty grains of any sort (this in turn also helps increase attenuation). To ensure the beer’s golden-blond tinge, only malted barley that is dried gently in the kiln should be used. High-temperature kilned grain becomes amber or even brown and roasted, and would make a dark, not blonde, beer. The barley malt that goes into Pilsner nowadays, is the palest malt available. In fact, such malt is named for the beer for which it is most often used. 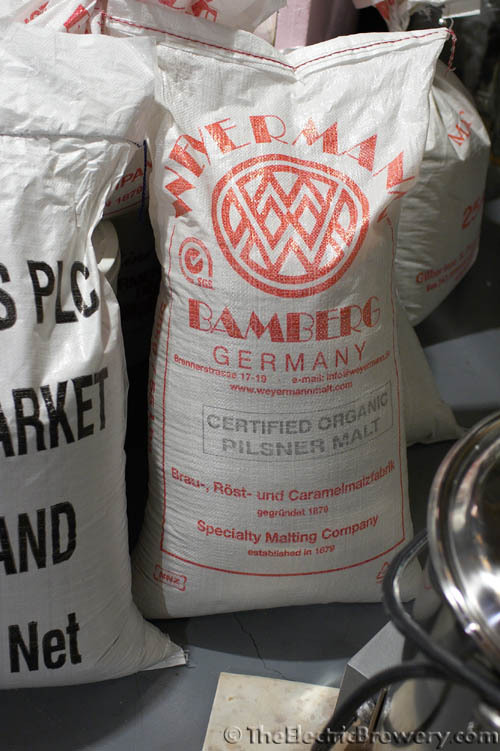 Brewers the world over now make their best Pilsner beer only with Pilsner malt, and many would say that the best Pilsner malt comes from (and I would agree) Bavarian farms and malting companies. I prefer Weyermann Pilsner Malt in this recipe. Unfortunately, several industrial lagers named Pilsner outside of Germany are frequently made with the addition of nearly flavourless rice and corn as cheap substitutes for the more expensive Pilsner malt, and many breweries use chemical agents to enhance the conversion of grain starches into fermentable sugars. I don't recommend these shortcuts for a German Pilsner. You would never see these practiced in a Bavarian brewhouse! Both Bohemian and German styles will tend to have a spicy and floral hop character but the overall impression is different given the different hops used. Bohemian Pilsner tends to use Czech Saaz exclusively while a German Pilsner will include just about any noble German hop with Tettnanger, Hallertauer, and Spalt being common varietals. Many northern Pils varieties rely on the slightly zesty Tettnanger for their up-front assertiveness so that's what we've used here. We then use Hallertauer as the finishing hop. Strike water at temperature, just about the mash in. Image (c) TheElectricBrewery.com. Water hardness also plays a role in hop flavour. While a Bohemian Pilsner is almost exclusively brewed with very soft water (low in minerals) most northern German varieties (including the version here) are brewed with harder water which helps accentuate hop-bitterness. The drier finish and less malty character of this German Pilsner combined with the harder water tends to increase the perceived hop sharpness or bitterness over a Bohemian Pilsner, even though the IBU may be lower. Don't confuse this hoppiness to be anything like an American IPA or similar new world beers however. The noble hops used in a German Pilsners are delicate, more floral, even earthly. A German Pilsner strikes more of a balance between malt and hops, with a definite nod towards hoppiness. At 35 IBU, this German Pilsner is about five times hoppier than the average American lager. 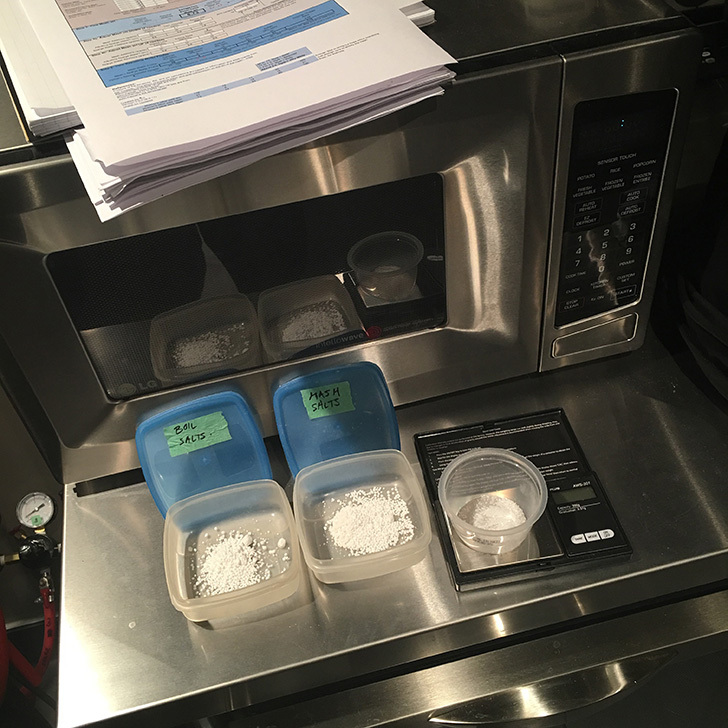 Measuring out salt additions of gypsum, calcium chloride, and Epsom salt. Image (c) TheElectricBrewery.com. The average Pilsner today has an alcohol content by volume of roughly 5%, which puts it into the strength range of an average beer. The recipe for a German Pilsner is deceptively simple. Because of its delicacy, however, only the very finest top-quality raw materials will do. The key is success is using the freshest ingredients possible, pitching the proper amount of healthy yeast, fermenting cold, and then cold conditioning for at least 2-4 weeks near freezing. The end result will be an amazingly clear beer with a wonderful grainy-sweet-rich malt character (often with a light honey and slightly toasted cracker quality) and firm floral/spicy hoppiness. Very refreshing. 12 gallons of German Pilsner chilling down to ~48F in the fermenting fridges. Image (c) TheElectricBrewery.com. 10 days in and fermentation is nearly complete so the temperature is raised ~10F to start the diacetyl rest until fermentation is done (3-7 days). Image (c) TheElectricBrewery.com. 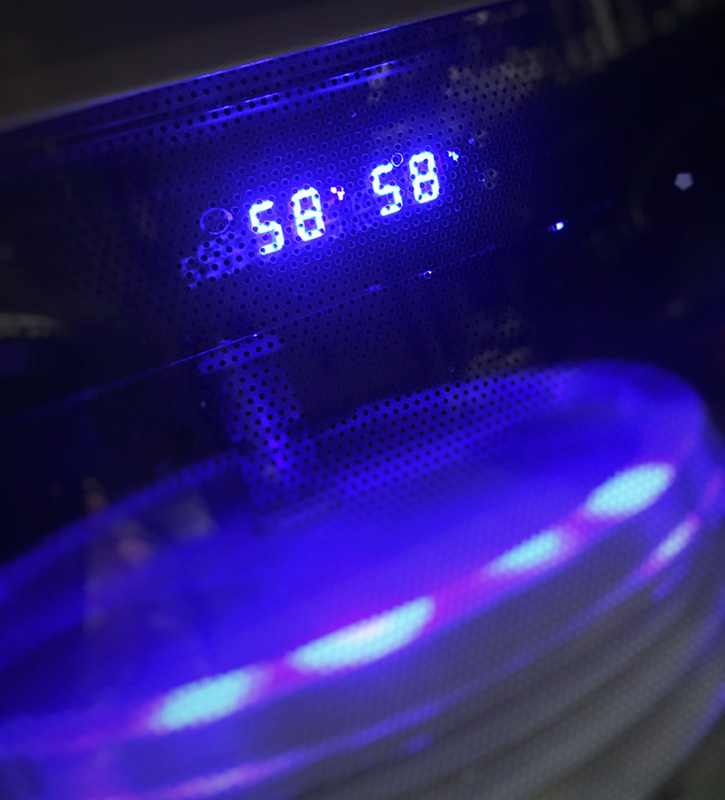 Like any beer you brew, treat the beer delicately when racking. Whenever racking the finished product, I highly suggest purging the target vessel (carboy or keg) with CO2 first to minimize oxygen contact as much as possible. Avoid splashing. Pay careful attention to your process and you can easily brew a German Pilsner that is decidedly fresher tasting and more aromatic than one that was imported from Germany. Beer is a somewhat fragile product and long trips in unrefrigerated containers wreaks havoc with it. Brew it fresh and enjoy! Fermentation done. Beer is racked into CO2 purged 5 gallon glass carboys. Gelatin added to clarify, then kegged ~2 days later. Note that it's normal for larger volumes of beer (5 gallons on right) to appear much darker than smaller volumes (small smaple on left). Image (c) TheElectricBrewery.com. Wonderful frothy head after 2 months of lagering near freezing. Delicious! Image (c) TheElectricBrewery.com. I first brewed this December 30, 2015 (batch #195). Brew up a batch and let me know how you like it! (Hit close to minimums on Ca and Mg, the Cl:SO4 ratio favours SO4 which enhances hop bitterness but not as much as an aggressively hopped American style). 2.0 qt/lb mash thickness. Single infusion mash at 148F for 120 mins. Nice write up! You might try just adding the gelatin to the primary so you don't have to rack to secondary. It works fine in my experience. Also, do you routinely use plastic buckets to ferment? Are the stories of infections all myth? Sure - that'll work too. In a brite tank (my 5 gallon glass carboys) there will be less yeast. If someone wants to save the yeast for the next batch and is using buckets or carboys then I wouldn't recommend adding gelatine to the primary however. Also, do you routinely use plastic buckets to ferment? 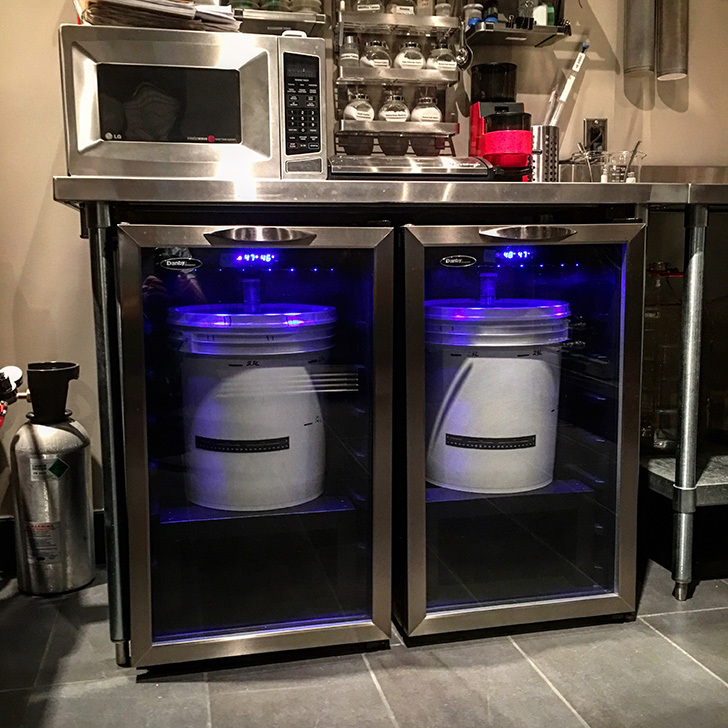 Per my article, there's no "best" fermenter. (I get asked this all the time). People should not use what I use. They should use what works best for their process, how they like to brew. This includes things like how they like to (if they like to) harvest yeast. Plastic buckets (I find for me) are the easiest to clean. They are also inexpensive and sturdy. They do not provide a good oxygen barrier for long term storage, and easily scratched and therefore more difficult to sanitize. For cleaning I use my spray air and spin them in the sink. I find it quick/easy and don't worry about banging things around. I don't care about the good oxygen barrier issue as I only ferment in them. As soon as the yeast is 100% done (often including some cleanup time at the end) I rack out of the bucket into glass. During fermentation CO2 is being expelled so there's always outgassing and O2 can't affect your beer. Some commercial breweries do completely open vessel fermentation and this works for the same reason. Are the stories of infections all myth? You can get an infection with any sort of fermentation vessel if you're not careful about sanitation. If your cut deep grooves or have deep scratches in your bucket then this could possibly be an issue. 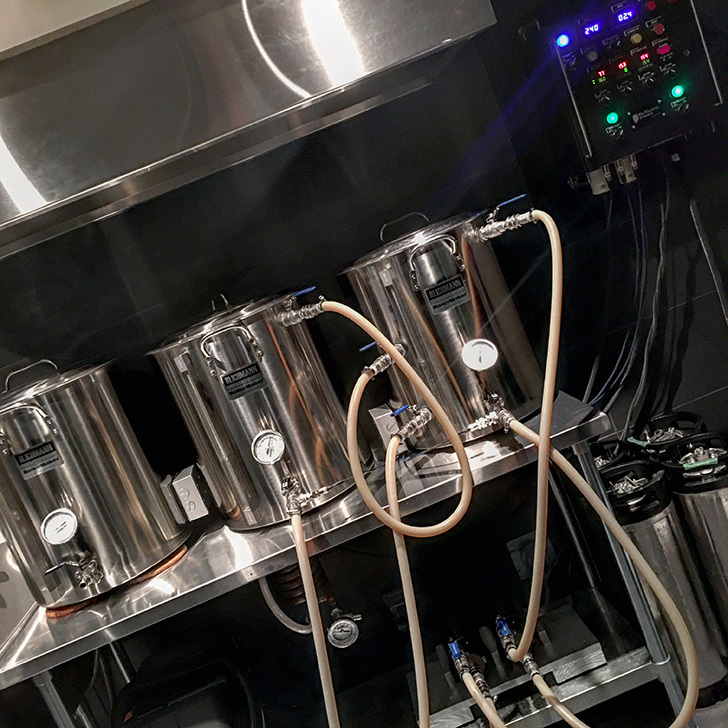 Clean your cold side equipment (like buckets) immediately after use, practice good sanitation, and most importantly: Always pitch lots of healthy yeast. One thing that people forget is that there's always "something" nasty in the air trying to get into your beer, wanting to infect it, wanting to spoil it. It's simply a race between that small amount of airborne stuff and the large amount of healthy yeast - which will get a foothold first? Nobody brews in sterile conditions. The moment your wort exits your chiller hose it hits the air where thousands of small microbes/bacteria/etc are floating around in the air and get in contact with your wort. 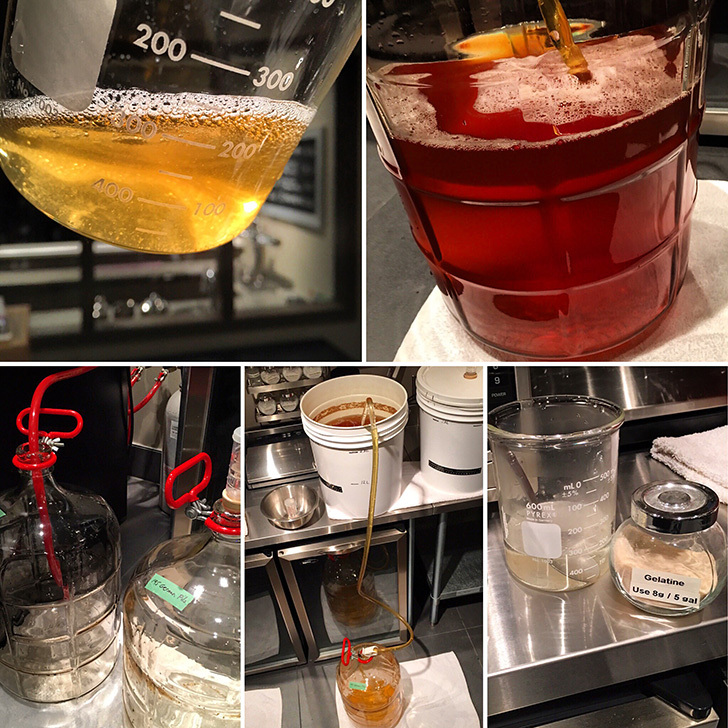 They start working right away on your beer, trying to infect it, trying to turn it sour. There's no avoiding this. This trick is to overpower these nasties with 1000x more healthy yeast so that it takes over and we control what happens to the wort. I've been using buckets since the late 1980's and some of the ones I have are 20+ years old. Kal, do you know if it can be fermented with dry yeast? I would use ~48 grams. EDIT: Or possibly even more, as much as 72g. You want this to ferment clean and fast. The W-34/70 will make an awesome Pils. Do it! Wonderful frothy head after 2 months of lagering near freezing and beer is crystal clear. Delicious! The last time I brewed a German Pils, my brewing liquor had Ca=65, Cl=34, SO4=102. I really liked the crispness that it gave to the beer. I see that it is similar to your profile, except that your chloride is a bit higher. In addition, I found that most of my friends enjoy this beer most when I use domestic Pils malt rather than German Pils malt! Most of them find the stronger flavor of the German Pils malt to be too much! I can see what they mean to an extent. I like the malty flavor, but I also enjoy this with the less malty flavor of domestic Pils malt. Sure! That's the beauty of brewing. You can make it to suite whatever style you're going after. Use north american malts and call it an American Pils. I should try that myself. I've always used Weyermann Organic Pils but it would be interesting to try something more north american too. I'm drinking down a nice glass of German Pils right now, brewed on my E-HERMS. It tastes really nice, but the head retention is pretty bad I'd say. It has a decent head at first but then quickly dissipates. I'm wondering if I shouldn't add a dextrin malt at maybe 5% from now on? Also, Kal, is there a reason you don't use W-34/70 on this? I use that yeast on all of my lagers, and they always turn out fantastic. And, it's so easy to get a huge pitch of yeast by rehydrating more dry yeast! I'm drinking down a nice glass of German Pils right now, brewed on my E-HERMS. It tastes really nice, but the head retention is pretty bad I'd say. It has a decent head at first but then quickly dissipates. I'm wondering if I shouldn't add a dextrin malt at maybe 5% from now on? I would go to the source and fix the issue. Adding something like dextrin malt is a crutch. Also, Kal, is there a reason you don't use W-34/70 on this? You could certainly use W-34/70 instead of WLP-830. I haven't done any direct comparisons. I don't see dextrin malt as a "crutch." It's just a way to boost head retention and maybe provides a touch of mouthfeel. It's a lot easier than trying to modify any other number of variables in the brewing process to increase head retention. For example, i could do a lower temperature rest to get more protein modification to increase head retention, but that takes more time. I don't see dextrin malt as a "crutch." It's just a way to boost head retention and maybe provides a touch of mouthfeel. Mouthfeel sure, but if one brewer's adding dextrin malt like Carapils/Carafoam it to fix head retention issues they're having while others don't find the need then I'd definitely call it a bandaid fix or crutch as it really shouldn't be needed for head retention. "The key to making a great German-style Pilsener is ensuring that the beer attenuates enough to make a crisp, dry beer. If there is too much residual malt sweetness, it is going to be too sweet and heavy for a good representation of the style. It is important to avoid crystal malts or any other speciality grain that adds non-fermentable sugars to the beer, which will work against the desired crisp, dry results." YMMV. You can make it any way you like of course! I guess it depends on a lot of factors and carapils could be a way to level the playing field. Sometimes different batches of malt are better or worse at providing head retention proteins as well. Who knows. I would be primarily concerned that it may hurt the dryness/crispness of the beer which to me is more critical than head retention (IMHO). Dextrin malts add unfermentable sugars to beer which increase sweetness (raise final gravity). It really needs to attenuate low. You might run into a fuller mouthfeel, but the sweetness is a non-issue. I haven't really found carapils at 5% to give much of a mouthfeel though, mostly just foam. I have tried going over 10% carapils in session IPAs, and it's not like they turned into this super thick beer. I'm not even sure it impacted the mouthfeel that much. I was using pretty high gypsum in those beers though, which I now realize was a mistake for session IPAs, but my point is that I wouldn't be afraid of 5% carapils. I doubt anyone would even know it was in there. As long as the yeast ferment all of the simple sugars, it won't be sweet. I mashed this last Pils I did at 165F, and it certainly is not sweet. I just do it so that I can put in more malt but still get the same ABV on my beers. I am wondering if I might lose some head retention by mashing so high though. I'll have to see if that seems to be a re-occurring theme. I haven't made a Pils for several years, so I don't have much to compare it with. I made this recipe some 3 months ago. Two 5gal kegs I filled. The first keg I opened one month after lagering and conditioning, the hops was off, I must say, I did not like the flavour. Now, 3 months after I opened the second keg and the taste is absolutely wonderfull. It changed a lot. Now I am sure I will make another batch. I'm going to have to give this one a try soon! Just finished kegging another batch of this great beer tonight ... the sample tasted great! Kai, Brewing this next Saturday. Curious as to why the 2 qt/lb mash thickness and why a two hour mash? Thanks. Generally speaking, a thicker mash (less water) produces a beer that is fuller/sweeter as it creates more unfermentable sugars while a thinner mash (more water) produces a thinner/dryer beer as it creates more fermentable sugars. While most of the starch to sugar conversion will take place in the first 30-60 minutes, a longer mash maximizes conversion as the mash temperature is low (conversion takes longer at lower temperatures). Don't be afraid to go to even 3 hours on this beer. You want it dry.